I don’t know what I was expecting when I read Katie’s rant the other day on how unfair and silly the early calls for Luongo’s head are. Here I was thinking that people who read it and think “Oh, maybe we are being a little unfair… I mean, the guy backstopped the Canucks all the way to game 7 of the Stanley Cup Finals. But alas, for every person that agrees, there are two more that think we’re the crazy ones. I really don’t think I would’ve bothered to put in my two cents but I was at the game Tuesday night sitting behind a guy that started heckling Louie before the last lines of O Canada. I understand at the end of the game when he’s 4 goals behind on 16 shots but before? Nothing says bandwagoner (…I hate sitting in the lower bowl) more than stuff like this where someone has made up their mind and boos their own team when they’re in a bit of a slump. …especially so early in the season. …especially since the home team went to game 7 of the Stanley Cup Final just a few months ago. I always thought that was more of a Toronto thing. It must be great fun to only cheer for your team when they’re winning and disown them completely when they’re not. That way, your team never loses! You only have to cheer for the Sedinery, Hamhuis Hammer Time and LUUUUUUU when he actually plays standing on his head. Never those bums that can’t take a hit, can’t shoot the puck or can’t stop a beach ball. Fact of the matter is this exact thing happened last year. I don’t have a crystal ball so I can’t tell you the Canucks will be the best team during the regular season for a second consecutive season but they were last year after a similar start. Vancouver freaked out and the weirdos called into TEAM 1040 in force, calling for AV or Luongo or whoever was the scapegoat that day to be tarred and feathered. The emergency room was full of people breaking their legs from jumping off the bandwagon. The rest is history. The Canucks were lights out for the rest of the year and came within a game of the Stanley Cup. Luongo can’t win the big game. He can’t make the save when it matters. Luongo is overpaid. He’s the highest paid player on the team and needs to play like a $10m goalie. Luongo is just not a good goaltender. There are so many other goalies in the league that are better than him. Let me break these down for you one by one. The argument that he’s not a big game goalie has followed Louie throughout his career. He wasn’t able to make it to the playoffs playing behind an awful Florida team and in his first year playing behind a heavily defense-orientated Canucks team, he wasn’t able to get them out of the second round. I won’t use the Olympics argument here since I believe winning Olympic Gold is easier than a Stanley Cup. Yes, you play against an entire team of world class superstars but at the same time, your teammates aren’t slouches either. There are also far fewer games and it’s played at the mid-point in the NHL seasons rather than the end, when the grind of an entire year of hockey has worn everyone down. That isn’t to say the Olympics aren’t a huge deal because they are but the Stanley Cup is probably the hardest trophy to win in sports. The fact is, Luongo came within a game of winning it all. Logically if people are going to use Luongo’s lack of Stanley Cup success against him, then that same argument would mean that Luongo was last year’s second best goalie after Cup winner Tim Thomas. I don’t know about you but second place isn’t a bad return on your investment considering there are more expensive goalies in the league who fell much earlier and should be subject to even more scorn. Look at Tuesday night’s hero Henrik Lundqvist, whose Rangers were bounced in 5 games in the first round last year by the Washington Capitals. In case you didn’t know, Lundqvist has the NHL’s highest cap hit among goaltenders ($6.875 million) and has only won 1 playoff game in the last two years and 4 playoff games in the last three years. Does anyone in New York call King Henrik an overpaid bum? In that same span of three years, Luongo has won 27 playoff games. Since coming over from Florida, he’s won 32 playoff games. Since the lockout, only Marc-Andre Fleury has won more playoff games (40) than Lou. Luongo is not a $10 million dollar goaltender by any definition this year. During the first year of his new 12-year contract last year, his take home pay was $10 million. This year, it’s $6.716 million. This year, the only goaltender being paid $10 million is Philadelphia’s Ilya Bryzgalov. But either way, all of you armchair GMs out there calling for trades or demotions or buy-outs need to understand that Luongo is not a $10 million goaltender. He isn’t even a $6.716 million goaltender. He is a $5.33 million goaltender because that’s his cap hit. I don’t know how much exactly Francesco Aquilini has in his savings account but his net worth has to be in the billions. He isn’t concerned about what the players are being paid each year as I’m sure GM Mike Gillis has the authority to make moves without financial restraints other than the salary cap. Therefore, the only number that matters is $5.33 million, which puts Luongo at no. 8 among all goaltenders in the league. Last year, Luongo was tied for the most wins in the league (38 with Carey Price) with the second-lowest GAA (2.11). It’s safe to say that he’s in the same conversation as his fellow Vezina nominees Tim Thomas and Pekka Rinne as the best in the league. Thomas’ record-breaking GAA won him a Vezina and Rinne is an amazing goalie that would probably be even better on a better team, but for argument’s sake, even if we put Luongo at third best in the NHL, third best is still a solid return for the 8th-highest cap hit for a goaltender. Oh here where it gets even better, Louie Haters! Over the last three years, of the top-10 goalies in terms of cap hit (Luongo, Brodeur, Lundqvist, Ward, Kipprusoff, MA Fleury, Miller, Thomas, Bryzgalov and Backstrom) only Kipper has averaged more wins than Luongo per year (39 to 37). But also, Kipper averages 73 games played per year versus Luongo’s 60. That means of the top 10 goalies in the league (in terms of cap hit), Lou has the highest winning percentage of all of them in the last three years. If you’re wondering, the only goalies outside of the top-10 cap hits to break into the top-10 in average wins over the last three seasons are Pekka Rinne ($3.4 million, 31 wins per year) and Jonathan Quick (who is a bargain at $1.8 million and 31 wins per year). However, they both average more losses and fewer shutouts, although Rinne’s GAA and save percentage are a hair better than Luongo. Of the top-10, only Thomas and Brodeur have lower GAAs in the last three years, though both averaged few games and faced fewer shots than Luongo. In that period, each also had a record-breaking season and an absolute stinker of a season. Luongo’s “worst” season as a Canuck was in 2008/2009, when he was limited to 54 games and still won 33 games and posted 9 shutouts. For his $5.33 million salary, Luongo is one of the best, if not the best, in the business… and it’s safe to say that his salary reflects his standing in the NHL as a premier goaltender. There may be a better goalie out there one year or one that costs much less but year after year, you’re not going to get much better puck stopping for your buck than in Roberto Luongo. The numbers speak for themselves and they’re telling you that thinking of Luongo as a terrible goaltender who isn’t worth his insane salary is… and how can I put this nicely… wrong. Great goalies don’t just grow on trees. Even if the Canucks were to trade Luongo, replacing him wouldn’t be easy. Argue for Cory Schneider all you want, but the most he’s played in a season is 25 games so we have no idea how he’d cope with playing 65 or more. We know how Luongo plays when he’s given 60-something games and that bar is set rather high. Some may argue that Luongo’s numbers are strong only because the team around him is one of the best, if not the best, in the league. Oh, well isn’t that convenient. You can place all the blame on Luongo when the Canucks lose but refuse to give him any individual credit when he does well? The reality is that separating the two is impossible. We have no idea how Luongo would perform on another team at this point in his career or how this Canucks team would play with another keeper between the pipes but keep in mind that although the wins weren’t there, Luongo had relatively amazing stats when he was in Florida, playing behind a team that was never good enough to make the playoffs. So calm down, Canucks fans. Stop calling into sports radio and ranting on about how Luongo should be traded. You’re just making yourself look silly. Well said. I have to say though that in regards to the critique that Lou can’t win the BIG games that that still remains mostly true. Fans criticize Lou because the BIG games were games six and seven where a win there means we lift the cup. And until we do win the cup with Lou on board he’s never going to get respect for just getting us close and then falling apart. But I hope we don’t trade Lou. We’ll never get anything worthwhile in return and hey, Timmy won the Conn at 37. Lou’s only 32. There’s still time. The main fact about Luongo is that – He is AWESOME! Lets appreciate our AWESOME goalie because he is AWESOME. He is a top 5 goalie in the NHL. He is not overpaid. We would be better off without him. Yes, you read that right. 1. Schneider is good enough. Only one top end goalie has won the cup since the lockout, that happened last year. Something had to give, two top end goalies were in the final. Schneider is arguably the best backup in the league and would be a starter on most teams. 3. #2 above does two things, first it covers 30 minutes of back end ice time per game and two, marchand isn’t speedbagging Sedin. It’s my hope, that a team like Florida, who struggles to spend to the minimum required will take a front end loaded contract like Luongo’s in the next couple of years when the amount he is getting paid is less than his cap hit. IE They will WANT the 6+ million cap hit and like that they only have to spend 2.5 or whatever the number is. things 1.Schneider isn’t a proven season starter yet. beyond its past seasons of 40 years. So of the teams that have won the cup since the lockout, name which had a proven top goalie? *HINT – there is just one. Money is better spent on a different position. Schneider is good enough. I’ve seen a couple blog posts on ‘the Luongo issue’, and I agree with what you’ve said here. Lou is a bargain for his cap hit, and would be easily moveable if the ‘Nucks decided to do so. I do think that Luongo will win the Cup; I don’t know if he will do it in Vancouver. I have a suspicion that the fans will run him out of town. To me, Lou was hung out to dry by Coach V’s single-line scoring strategy and the ‘Nucks lack of depth. Despite having the best overall scoring in the NHL, the ‘Nucks were a one-line-plus-Kess team; however, they played like they had 3 scoring lines, a weakness which was exposed by Chicago and Boston both. This season will be the true test. With Higgins & Booth on Kess’ wings, Vancouver has a real 2nd line, and a real second-unit PP.There is, however, one point that you don’t address in your post: Lou has simply not been good in the playoffs for the past 3 years running. Since 2008 (when the Canucks went from a trapping style to a freeflow attacking style of play, Luongo’s regular-season performance has been at his regular high standards: 2.35 GAA with a .919 Sv%. However, looking at the playoff performance over that same length of time, he has the following: a 2.73 GAA with a .909 Sv%.BTW, it’s not just Lou; the ‘Nucks give up a shot a game more during the post-season — you know, the time when the contenders are playing better hockey.It’s that reality, coupled with his spectacular play during his first post-season, that makes many Canucks fans feel that he’s not trying in the post-season. 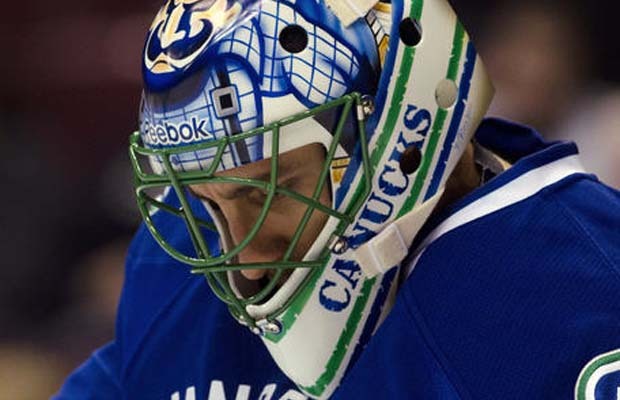 And it’s that reality, mixed in with the volatility of the ‘Nucks faithful and especially the way that we treat goalies, that makes me worry that when we see Lou lift that silver mug over his head, he’ll be doing it for some other team. If the regular season mattered then this would matter. Cups matter. In 20 yrs, you can look back on your record and say “I was a damn fine regular season goalie with great stats” at the end of the day, however, you dont have a Cup. Kypreos has a cup ffs.